and tolerant of the weak and the wrong. After retiring from the refinery as union president, Fairburn Moseley took on the job of chaplain for a hydrant/valve corporation in Beaumont, Texas. My grandfather’s job was to visit and pray with employees that were sick or injured. 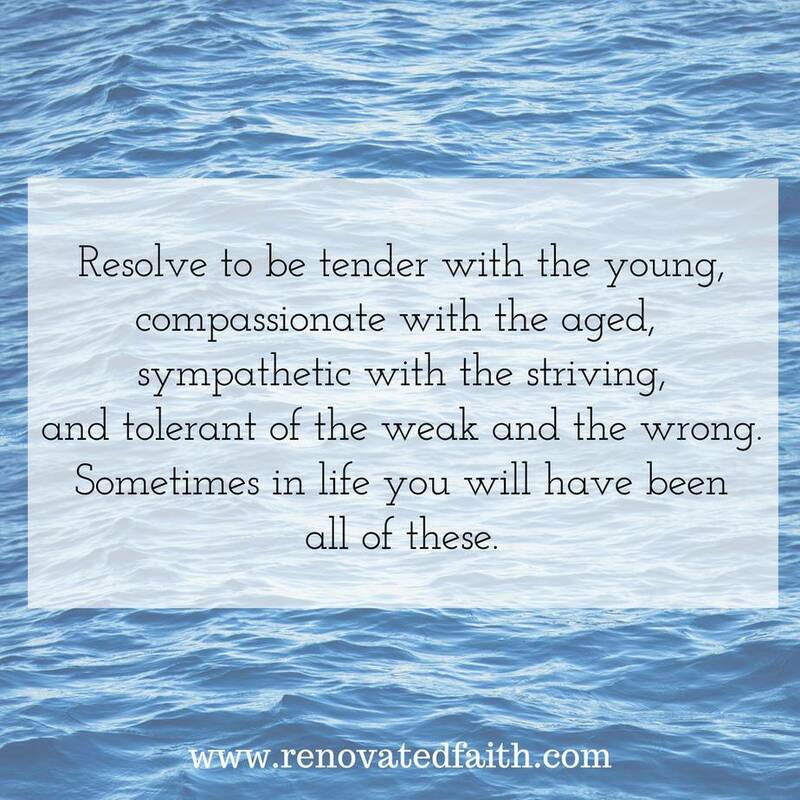 He thrived in this capacity as someone who showed mercy to others with an attitude of humility. For as far back as I can remember, he was always present in my life. He was there at my piano recital. He was there at my ballet performance. He was there when I busted my knee in the driveway. He even took me fishing. 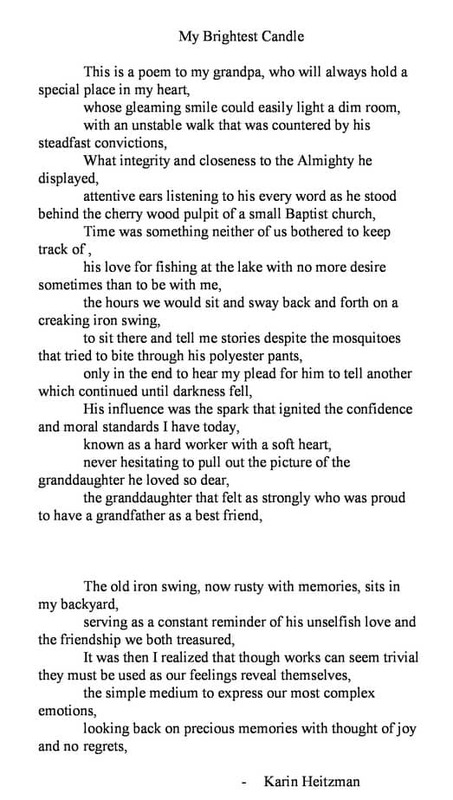 So many times, we would sit together on the wrought iron swing in the back. We would swing for hours on end. Sometimes we just sat. Sometimes we would talk. But always, he was there. 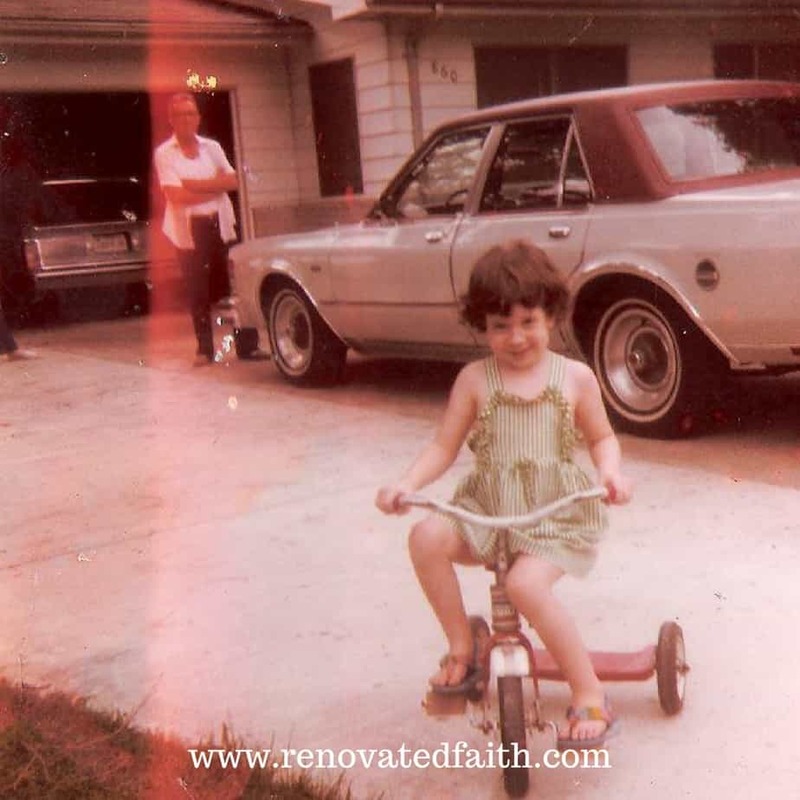 Every Sunday after church we would go to my grandparents’ house as they lived just down the street from the church. We had a weekly ritual of ordering pizza and eating it on tv trays in their living room while watching tv and talking. Our Sunday lunches were definitely low-key, but that didn’t change the fact that they made a big impact on me. I can still smell the pizza and feel the warm sunshine that streamed through the windows over my grandma’s sewing machine. Late one Saturday night, I talked to my parents and decided to invite the Lord to “live in my heart,” as Baptists say. Basically, I invited Christ to be Lord of my life by asking forgiveness of sin and professing my trust for salvation in Him because of Christ’s sacrifice. This was the beginning of my relationship with Christ. This was not an empty act but the first day of the rest of my life. 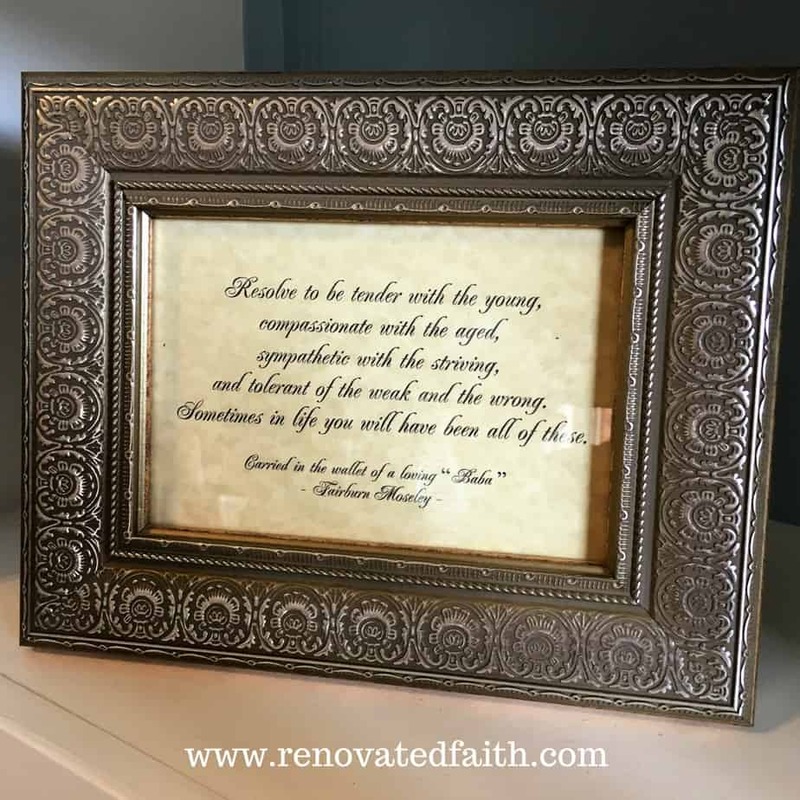 There was nothing profound about those words but by his heartfelt demeanor, I knew He valued what I had done….rather, what Christ had done in me. His presence in my life was vital to understanding how God loves me. I learned that humility and mercy go hand in hand. 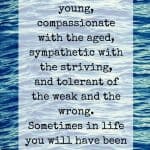 Out of his mercy, my grandfather wanted to give me the very best but was humble enough to realize that the best he could give me was not of him. He was a conduit of love, grace and peace that was straight from God. In my grandpa, I saw Him. The same applied to how he loved others. No matter their age, not matter their social status or intelligence, he loved them with the very love of Christ. 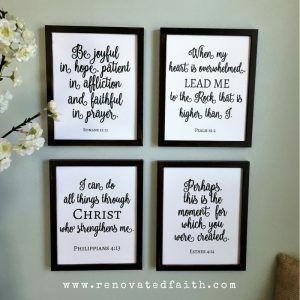 What God needs most are men and women like him, who are willing to be present, to be full of grace and to exemplify the very qualities of God Himself. Because of my relationship with my grandpa, whom I called Baba, I was able to better understand the same kind of characteristics in God. – He approves of me. He never leaves me. He wants to spend time with me. So often I struggle as a parent to know if I’m doing enough to encourage her faith. In reality, the biggest impact I can make on her is focusing on my own faith – spending time with Him and allowing her to see Him in me. My greatest parenting strategy is nurturing my own relationship with Christ. The greatest impact we can make in the life of another person is loving them well and encouraging their relationship with their Creator. True ministry means getting out of God’s way in order for Him to intercede through us to offer grace, mercy and love to a lost and dying world. This is not a flash in the pan ministry strategy. There is nothing hurried or showy about God’s most important means of discipleship – establishing meaningful relationships with others. 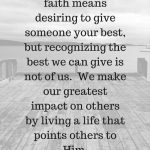 Leaving a legacy of faith means desiring to give someone your best, but recognizing the best we can give is not of us. We make our greatest impact on others by living a life that points to Him. 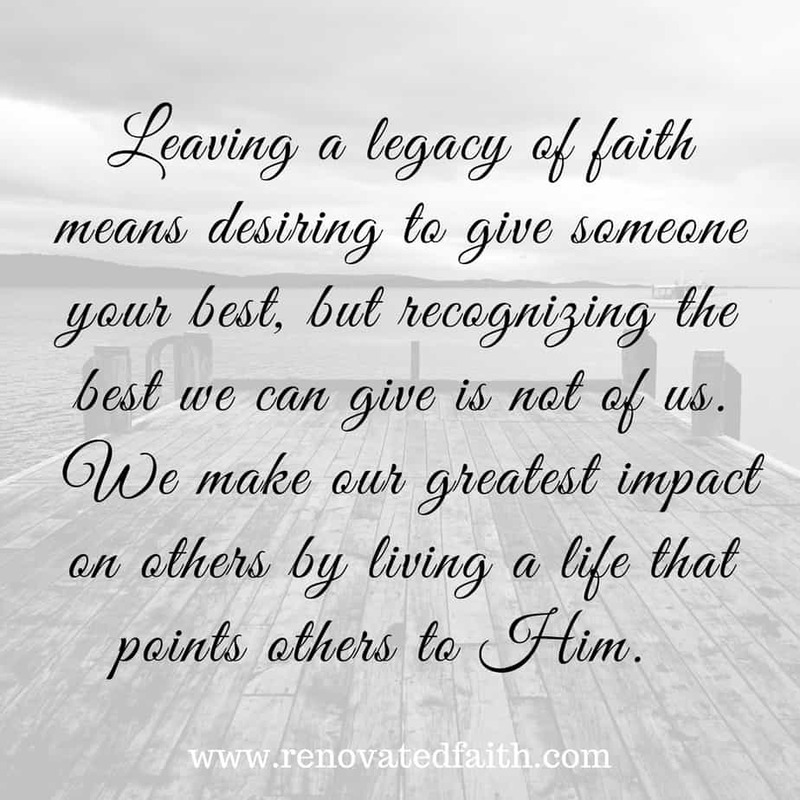 God designed us to reflect His characteristics by leaving a legacy for others like a bright light for others to see. Through an attitude of mercy and humility that comes from God Himself, we can do that. 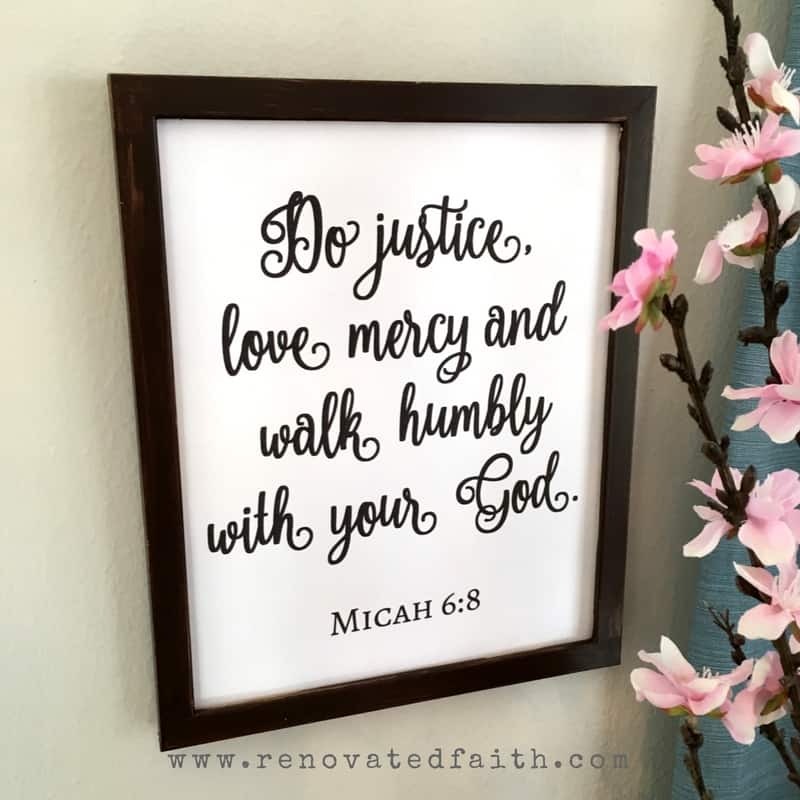 My grandfather lived out Micah 6:8, “He has told you, O man, what is good; and what does the Lord require of you: to do justice, love mercy and walk humbly with your God.” God desires to free you from the burden of slavery and sin. He is gentle and humble in heart – not giving us what we truly deserve but instead, lavishing us with grace and love beyond measure. As I pass by this quote on my bookcase, I’m reminded not of the words on the page but the man who made them come to life. I only knew him for 12 years but the lessons He taught me about how God cares for His own will last me an eternity. Thanks for taking the time to read about my grandfather that is still so close to my heart and memory. Beautiful post! That quote is frameworthy for sure! !What a beautiful legacy. That was a beautiful story of grandpa. He was an amazing man. Thank you for sharing!